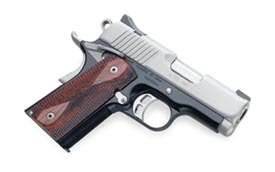 Five years have passed since Kimber of America, known for their production of a small selection of a small number of fine rifles, began their bold talk about providing a fine line of 1911’s. When it came to features, the talk got bolder. When it came to price, sane folk rolled their eyes and concluded that Kimber’s bold talk was just that. Bold talk. Kimber Manufacuring, Inc. backed up the bold talk with a bold walk. 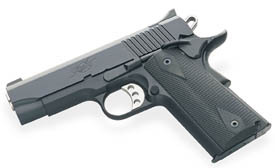 According to the front page and centerfold article in “American Handgunner” (September-October 2000), Kimber now has a 40% share in the venerable 1911 market. 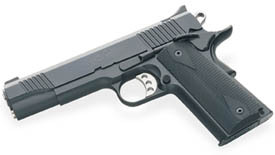 My first Kimber was a used “Custom Auto Pistol,” an as is out-of-the-box .45 ACP with a five inch barrel. Its original owner was an eastern Kentucky divorce lawyer (a profession which must rank in the top ten “most dangerous ways to earn a living” category). The attorney had traded it in for a Kimber Gold Match model. It continues to be an excellent gun. I next acquired a Kimber “Pro Carry” with a four inch barrel. A first rate pistol which has performed flawlessly for over 6,000 rounds. I then purchased an “Ultra Carry” with a three inch ball joint spherical bushing-less cone barrel. I experienced feeding problems which were not alleviated by a trip to Kimber. I was about to send it back for the second time when I saw a Kimber “Ultra CDP” (Custom Defense Package). It is a handsome gun- meltdown treatment, night sights, ambidextrous safety, frosted silver stainless steel slide atop a black frame, front strap checkered at 30 lines per inch, rosewood grips, etc. I quickly convinced myself that I needed that gun. The dealer with whom I had discussed the problem with the “Ultra Carry” was quick to suggest that I trade up to the “Ultra CDP.” I did. I understand that a new dual recoil spring system cured the “Ultra Carry” of its feeding problems. The dual recoil spring system is the key component which permits Kimber to produce a .45 ACP with a three inch barrel. If I have my facts in order, this approach was originated by Larry Seecamp for his small .32 ACP pistol. This system (Kimber uses a Wolff spring system) retards the speed of the velocity of the slide, in order to allow time for the magazine spring to properly position the round to be chambered. After the initial 1,500 rounds using a wide variety of ammunition I am delighted with the gun. A borrowed Ransom bench rest produced flawless results. My own efforts have been better than I expected. I cannot really differentiate between the recoil from the “Ultra CDP” and the “Pro Carry.” I would say that the trigger has a smooth break but I think the preferred terminology seems to be “crisp.” Whatever. The “tuned” ejector (“tuned” = extended) hasn’t once bonked me in the forehead with a spent case. The undercutting below the trigger guard works well with the checkering for me and I am able to regain target acquisition with minimal effort… an impressive claim for a twenty-five ounce gun. I like the Tritium dot system- two rear dots on a McCormick sight with one dot on the front work well for me. The “Ultra CDP” is a wonderful pistol. I have looked at the “Compact CDP” with a regular frame and the “Pro CDP” with a shorter frame- both are equipped with four inch barrels and this option may be more appealing to some. Since the frame is the difficult to conceal portion, the “Pro CDP” should attract those who are leary of the three inch barrel. I find the Ultra CDP carries well in a Milt Sparks Mini Max (MMX) IWB holster. This well designed holster is about as minimalist as feasible and has the additional benefit of being designed to securely holding the five, four and three inch barrel models. This holster has a reinforced metal mouth with a front sight channel and leather backing which covers from muzzle to the top of the slide. I haven’t seen much publicity for this holster but I think it is a best buy.